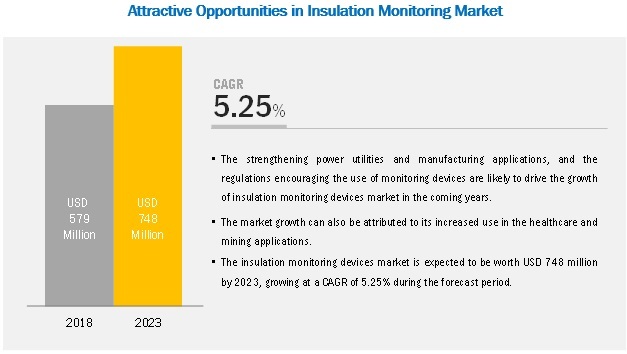 [113 Pages Report] The insulation monitoring devices market is expected to grow from USD 579 million to USD 748 million by 2023, at a CAGR of 5.25% during the forecast period. The prevention of data loss due to power supply fluctuations, necessity of electricals in IT systems, and increased demand for insulation monitoring devices from renewable energy power plants are the key drivers for the market growth. The response time for the insulation monitoring devices is an important parameter mentioned in the specifications for these devices. The applications such as power utilities and mining require a faster response in the form of an alarm in case of an insulation fault. The insulation monitoring devices in mines and power utilities applications trigger alarms at the insulation faults to ensure the smooth functioning of equipment wherein it is relatively necessary to take the utmost care of the process in place. The global mining industry has witnessed several disasters in the past. The frequency of explosions leading to the deaths of a large number of workers was high before the 1990s. However, the use of protective equipment has significantly reduced the risks for miners. The capability of detecting explosive gases still remains a key parameter to monitor the safety of miners. Hence, implementing the insulation monitoring devices to detect insulation faults can significantly reduce mining fatalities. North America, being a developed and technologically advanced region, is likely to be one of the key contributors to the overall market growth during the forecast period. This region is a key market as it is home to some large manufacturing and oil & gas companies. The US is expected to witness automation in various sectors pertaining to industrial production, which is likely to boost the use of insulation monitoring devices. The increasing R&D for new and improved technologies, and rising demand for safety and smooth functioning are the crucial factors driving the growth of the market in North America. The rising demand for worker safety solutions in the manufacturing and production, and oil & gas industries as well as in power and utilities to improve the performance and safety of workers and reduce the overall operational costs would lead to the growth of the market in North America. A few companies in the market are ABB (Switzerland), Littelfuse (US), Schneider Electric (France), Bender (Germany), Eaton (Ireland), Mitsubishi Electric (Japan), Siemens (Germany), Viper Innovations (UK), Cirprotec (Spain), and E. Dold & Sohne (Germany). Schneider is the leading player in the insulation monitoring devices market. It provides various insulation monitors based on application- as well as voltage-related requirements. The availability of other power factor quality and correction systems as well as safety systems makes it a major system and process monitoring player for various industries. It holds a leading position in most of the markets it serves. The company invests a major portion of its revenue in R&D. It focuses on going a step further and helping its clients by training them to understand and use its products better. In January 2017, Eaton received a contract from the US Army Engineering and Support Center, Huntsville (Alabama), to assist the Utilities System Division of the Naval Facilities Engineering Command (NAVFAC) Southwest. According to the contract, the company assists the division in modernizing control systems and electrical monitoring at its facility in San Diego. In March 2016, Littelfuse acquired the circuit protection business of TE Connectivity (Switzerland) for USD 350 million in cash. The acquisition helped the company in the expansion of its product portfolio as well as geographic presence. In December 2016, Bender revised its product line of insulation monitoring devices, and the characteristics of these products were rewritten in a new edition of the European product standards EN 61557-8, -9 and -15. The revised edition by the company addresses the increased requirements from various applications and new meteorological capabilities. Which are the major applications in the insulation monitoring devices market? How big is the opportunity for their growth in the developing economies in the next 5 years? Which are the major companies in the market? What are their major strategies to strengthen their market presence? Will the growth of technologies such as AI and IoT, and the advent of factory automation help drive the implementation of insulation monitoring devices in the manufacturing and production applications? Which are the leading countries in the market? What would be the share of the North America and Europe in this market the next 5 years? What will be the role of the standards and regulations by governments and associations in the adoption of insulation monitoring devices? 7.2.1 Growth in Renewable Generation and Distributed Resources is Major Driver for Implementation of Insulation Monitoring Devices in Power Utilities. The study involved 4 major activities in estimating the current size of the insulation monitoring devices market. Exhaustive secondary research has been conducted to collect information about the market, the peer market, and the parent market. Validating findings, assumptions, and sizing with industry experts across the value chain through primary research has been the next step. Both, top-down and bottom-up approaches have been employed to estimate the complete market size. After that, market breakdown and data triangulation methods have been used to estimate the market size of segments and subsegments. 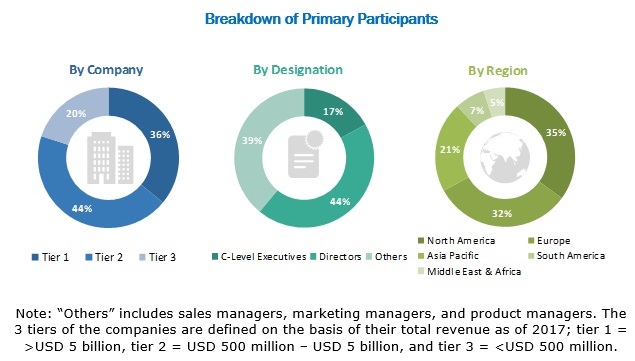 The research methodology used to estimate and forecast the market begins with capturing data on revenues of the key vendors in the market through secondary research. This study involves the use of extensive secondary sources, directories, and databases such as Hoovers, Bloomberg Businessweek, Factiva, and OneSource to identify and collect information useful for the technical and commercial study of the market. Vendor offerings have also been considered to determine the market segmentation. This entire research methodology includes the study of annual and financial reports of top players, presentations, press releases, journals, paid databases, trade directories, regulatory bodies, and safety standard organizations. 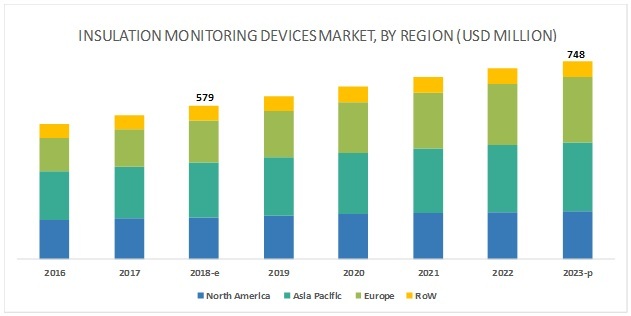 The insulation monitoring devices market comprises several stakeholders, such as suppliers, system integrators, suppliers of standard components, and original equipment manufacturers (OEMs) in the supply chain. The demand side of this market is characterized by the development of power utilities, manufacturing and production, healthcare, mining, and transportation applications. The supply side is characterized by advancements in types of insulation monitoring devices and its applications. Various primary sources from the supply and demand sides of the market have been interviewed to obtain qualitative and quantitative information. Following is the breakdown of primary respondents. After arriving at the overall market size using the estimation processes as explained above, the market was split into several segments and subsegments. To complete the overall market engineering process and arrive at the exact statistics of each market segment and subsegment, data triangulation, and market breakdown procedures have been employed, wherever applicable. The data have been triangulated by studying various factors and trends from both demand and supply sides in the power utilities, manufacturing and production, healthcare, mining, and transportation applications. This report categorizes the insulation monitoring devices market based on response time, application, and region.